Replying to emails, meeting parents and advising students about failing grades–these are just a few of the numerous tasks that guidance counselors need to juggle around the clock to help students achieve a brighter future. “I do different things throughout the day, every day, but I always have to be ready to have everything thrown out the window,” Desmond said. As a counselor for the class of 2022, Desmond’s work varies on a day-to-day and year-to-year basis. Whether it is helping students prepare career paths in their freshman year or for college admissions in their junior year, GLCs focus on different aspects every year. In his daily schedule, however, Desmond’s plans for the day could change with responsibilities like investigating problems on campus or dealing with students acting against school policy. Desmond often deals with students struggling to maintain their grade during the six week period, and he calls them up to his office in hopes of guiding them in the right direction. Now in his 19th year as a counselor, Desmond said that his most rewarding accomplishment is graduating five classes. 7:30 – 7:45 a.m Desmond arrives on campus and checks in to the office. 7:45 – 8 a.m He walks down to the lower quad for his Friday tradition of giving high-fives to students entering from the entrance next to the gym. 8 – 9 a.m After the bell rings, Desmond goes to his office to talk with students who have tardies. After, he checks attendance for students with repeated absences. 9 – 10 a.m He sits down with freshmen students to discuss their schedules for next year. He also talks to them about planning for college and preparing ahead. 10 -10:15 a.m Goes out to brunch at his designated spot near the library to supervise the students. 10:15 – 11:15 a.m At the end of brunch, Desmond heads to his office to prepare for students coming in with call slips to talk about their D’s and F’s. When he receives a radio call, Desmond goes out to deal with students caught vaping on campus. 11:15 a.m – 12:15 p.m Afterwards, Desmond holds meetings with students that are suspended and then answers parent phone calls. 12:15 – 1 p.m Finishing up with the last of his phone calls, Desmond heads out to supervise students near the second bridge, library and elevator during lunch. There, he talks to students who approach him for personal help and chats with the other GLCs. 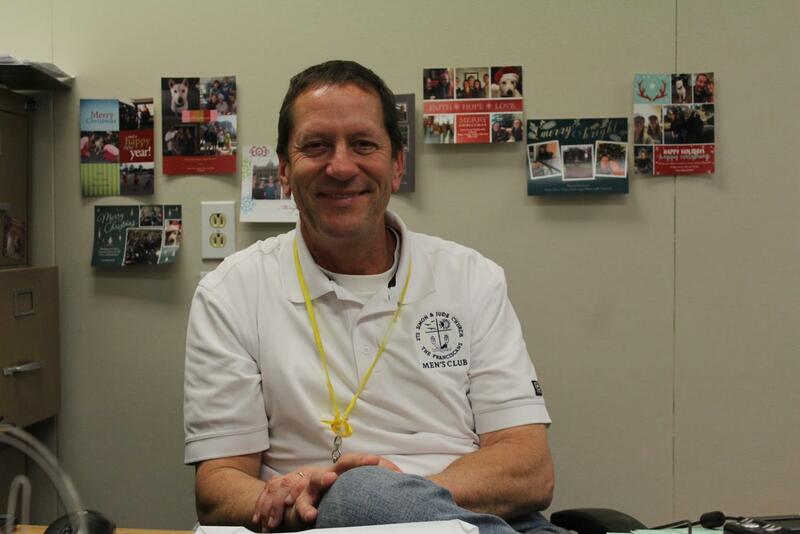 1 – 2 p.m He heads back to his office and sends out call slips to students about failing grades and other matters. However, a distraught student suddenly comes in for help so he talks about their problems with them. After they leave, Desmond returns to calling in students and eats his lunch. 2 – 3 p.m Desmond continues advising students with D’s and F’s about options for improvement. 3 – 4 p.m He finishes up replying to unanswered emails while meeting with students that come in after school. 4:30 – 8 p.m At this time, Desmond heads over to the gym to supervise basketball. After the game is over and everything is cleaned up, Desmond heads home.